A Vision of Hope and Faith - An Interview with His Highness the Aga Khan by Imran Aslam 2000-10-26 | Ismaili.NET - Heritage F.I.E.L.D. Imran:	Good evening ladies and Gentlemen, we have a very distinguished visitor here this evening. 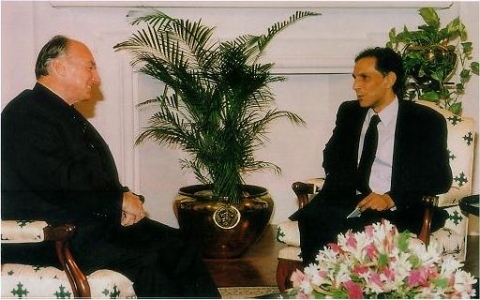 Somebody who has always been a great friend of Pakistan, he is the Spiritual Leader of the Ismaili Muslims, an illustrious son of Islam, and as I said earlier, every time he visits, the People of Pakistan look forward to it. Look forward to his interventions and to his great vision, which is always translated eventually into reality. I'd like to welcome His Highness the Aga Khan. -Aga Khan: Thank you very much indeed. Aga Khan: Thank you very much. Imran: Your Highness, I'd like to start off with asking you this question about Pakistan. We keep hearing all these doomsday scenarios paraded all the time about Pakistan's economy and its very existence as a state and when you turn up here suddenly we feel extremely encouraged. Almost like a vote of confidence in the people of this country and the resilient economy of this country. So is it fate or are there some empirical evidence to suggest that Pakistan should always be supported in the way th at you have done. Aga Khan: I would say it is logic-perhaps more than anything else. I was a student of history, and therefore I tend to measure national issues against historical backgrounds. I think that one has to be realistic about young countries. That young countries, like young children, like young societies, don't always get everything right. And I find it somewhat unkind to imply that Pakistan is the only country in the world where its attempts at put ting in place the function of democracy have failed. There are umpteen countries around the world, much richer, much older, with much more educated and potent societies that have gone through decades of failed democracy. So the question is to me, not the issue of the failing of democracy, to me the issue is why? And the next one is, what can be done to put it right? lmran: So you feel that there is, I am thinking more in terms of interventions that continue on your part, various social uplift programs, things like that, which have always been very encouraging. The question that is always asked is, obviously if there are long term projects in the pipeline then there is a lot of hope and fai th in the continuation of a country as itself, as a whole? Aga Khan: Well, I have never asked myself that sort of question. Again, I don't see any logic in asking it. I think what is important is that if you have institutions that have a long-term horizon, then they must build knowingly into that horizon and try to bring some new resources to stabilize and improve the situation. That's what being part of a country is all about. lmran: We also hear from the western media especially, and I think you personify the modern face of Islam, if I may say so. A face that is not normally unveiled by the western media. We hear a lot of the clash of civilizations and all that I have seen and read about yourself, has indicated that you always believed in the evolution of civilizations, building bridges, trying to avoid divisions. Now, was there a defining moment, which sort of made you position yourself in such a role or has it just come about? Aga Khan: I suppose it comes partially from my background, partially from my education. I think one has to try and look at what is happening to our world. The pluralism of our world has existed for centuries. But during the cold war it was frozen. And when the cold war thawed, plurality became visible and I think that what we are learning to live with now is expressions of pluralism which in the past simply were not manifested in the same way. I think now the problem is how do you manage these expressions of pluralism? How do you try to make sure that they coalesce around common desirable goals? Those are the questions, so this clash o f civilizations, frankly I don t see it. Imran: It's become one of those phrases that are bandied about all the time. Aga Khan: Yes, yes, it is like Nescafe. Imran: Instant phraseology. which takes us back to: we were talking about the cold war and I was thinking about your recent forays into Central Asia where again we see the emergence of cultures which have been to a large extent put into cold storage, if you like, and they are emerging. They're trying to relive their past to a certain extent, retrace their steps, look for their heritage and culture. So this integration of development work along with culture - is that how you see some of the work being done by yourself? Aga Khan: We, I think have been driven as a network of agencies by the immediacies of the concern. The civil war in Tajikistan, the threat of famine. The difficulty that these countries have had to move into a free market economy, whether it is Tajikistan or the other Central Asian Republics. So, my involvement there has really been to try to address these immediate issues in such a way that hopefully the solutions can be found and the time will be earned for change to take place. Because its time that they needed. lmran: Absolutely. This is something that we've seen. You've always made this point that it takes time, it takes a lot of will, determination, courage, and we look at some of the projects like you have initiated in the Northern Areas of Pakistan. There are some concerns, which I think we needed to address here, certain perceptions that are needed to be cleared. When we talk about the Northern Areas, these are geopolitically strategic areas, sensitive areas. And there have been concerns as to whether the choice of those particular areas with the uplift programs, the Rural Support Program have some sort of a hidden agenda, etc. These are the conspiracy theories that do make the rounds. I thought this would be a good opportunity to talk about them. Talk about the other communities that have benefited as well. -Aga Khan: Well. Let me start at the beginning. My first visit to the Northern Areas was in the late 5 0 s. And it was a dramatically isolated, poor area. Imran: Did you go by horseback? Aga Khan: Very nearly. And no seeing and feeling person could have ignored the awfulness of life up in that area. And it was all communities. It was an area of Pakistan that was isolated. All communities up there. What I started was a program, which had never been tested before in the mountain valleys. Which was to see whether we could develop a program where communities would develop and take their own destiny in their own hands - and I still deal with a number of test cases. And I started in Rural Support only. Then from Rural Support we moved into healthcare, education, cultural activities, etc. And, at the present time the program is very, very large. It applies to all communities who want the program to work in their areas. The constraints are human resources. The demands in the area are enormous. The financial constraints are less great. But I must tell you very frankly that there is absolutely no hidden agenda other than answering a critical national situation. I would say that this was not specific to Pakistan. Eastern Tajikistan, i.e. the mountain communities in the Pairs have lived the same difficu lty. It's admittedly in a different context because it was t he context of the Soviet Union, but the reality is that mountain communities generally are poor, often invisible and isolated. So that's the background and there is absolutely no hidden agenda. Sometimes I've been told that I'm being put forward as a person who wants a State or this sort of thing. I can tell you that idea has never crossed my mind. More than that it is an idea that if were put on the table would last in my view one millionth of a second - not more. lmran: The question that normally comes to mind about projects, which start off as models and pilot projects; normally there is difficulty in replicating this, and the critique normally is that you create a model which looks great, which looks very privileged as sort of an oasis in a desert of underprivileged around you and it causes and exacerbates tensions, causes some heartburn in the surrounding areas of the periphery. Is there some formula? I don't know if there could be a formula to sort of try and replicate these so that the spillovers are more possible? Aga Khan: Well, I can confirm without the slightest hesitation, that one of the criteria for launching programs is the potential for repeatability. So whether it's a rural development program in a mountain valley which could be applicable today in Pakistan tomorrow in Tajikistan or whether it is trying to address the desperate condition in higher education in Pakistan - again the Aga Khan University. The question is, are you trying to set a new means, create a new capability to address a national issue? Repeatability has its own constraints and limitations. And I really want to be very clear on that. I think many of these projects are replicable but not in identical methods. Imran: It's not cloning, because of societal constraints, things are changing, we're not dealing with an exact science. Aga Khan: So whoever wants to replicate really should make their own diagnosis of what it is that they are addressing before seeking to replicate. Now, we would love to work with anyone who wants to replicate and in fact the Rural Support Program has become a national program in terms of rural development in Pakistan. The Aga Khan University is having an impact on perceptions and objectives of higher education in Pakistan so there is, I think, an impact. Imran: A tremendous impact if I may say so. The other area that I would like to talk to you about is, you've been involved recently with this Philanthropy Conference and some of the figures that have emerged from there have been staggering figures, in terms of the amount of money that people are giving to charity, aid, various other things. It goes back to the existence of some sort of welfare safety net that exists outside government, if you like. But is that charity only to feed people or is it teaching them how to fish? Aga Khan: Well, I would hope it would be to teach them how to fish and my sense is that in the past much of the developing world has inherited a psyche of government on one side and private initiative on the other. That psyche again is not specific to Pakistan. But it is a horrible impediment to development. And what I am hoping is that the Philanthropy Conference, the outcome will create spaces of dialog, institutions for dialog, where government and private initiative will be able to work together to strategize as to what resources are needed, where to place them, how to make segments of society or institutions in society, self-sustaining because there is no doubt that in Islam the notion of creating self-sustainability through generosity is the best. Imran: It is the best. And of course an area that I am very fond of is this particular aspect of what you ve been doing, and that of course is Architecture, the encouragement of indigenous forms, the emphasis on design, and so forth. Why architecture? Why not any other cultural form if you like. Is it because its a physical manifestation? Aga Khan: It stems from a number of different notions, the first one is that through my work, one of the first things I realized that when an individual or a family have any disposable income to spend freely, the way they want, they will spend part of it on the house. So the house becomes a symbol of hope. Secondly, the symbol of hope is either appropriate culturally or it has been in some way taken off track. And if you look at the history of Islamic culture, and I should say cultures, architecture has been one of its greatest expressions and yet 25 years ago the Islamic societies of the world were not designing in their own cultures. Their taste, their technologies, all of that extraordinary cultural inheritance have disappeared and have been replaced by something totally outside. Aga Khan: That's why I wanted to see whether through human will and effort that could be changed. Imran: Wonderful, we have seen some brilliant manifestations, each year in fact. Aga Khan: I believe so. I believe the Islamic world today is producing as good architecture as any other part of the world. Imran: So, we know that you dream with your eyes wide open. Any new visions, any new dreams. Music was something somebody was telling me about. Aga Khan: Yes, I think that this notion of indigenous culture and respect and enhancement of that culture. Continuity with time, making it part of society's vision is something which is very, very important indeed and with a sort of internationalization of communications our society's are at risk and not only as was proven in architecture but is being proven today in entertainment and all the rest. So I hope very much that we can together enhance our own indigenous cultural expressions. They're free. Export them. Export them in the English language in such a way that the world has direct access to our own expressions of culture. Imran: That's very interesting that you say that because a lot of the indigenous folk forms end up being exactly that, folk forms. Which are based in museums and dusted out whenever either there are foreigners visiting or what have you. So they don't live, they don' t breathe and they become museum pieces. It is very enlightening to know that you are thinking in terms of evolving these forms and making them more accessible. Aga Khan: Oh yes, and I would feel that it is a source of happiness that the U.S. Government is actually becoming directly involved, which after all is the country that has the biggest global communications system in the world. It is actually seriously discussing how to sustain pluralism and culture in the world. So it's quite encouraging. Maybe a little late but better late than never. lmran: It's about time. Thank you so much. It been an absolute pleasure your Highness. We look forward to your visits all the time, every time. Thank you Ladies and Gentlemen and thank His Highness for sparing some of his very, very precious time to be here with us. Good night and may your God go with you.